Deborah and Mark Parker interviewed by Sarah McConnell on Virginia Public Radio's With Good Reason, as part of the "Heroes of Medieval Literature" show. On the heels of Dan Brown's instant bestseller Inferno, comes Inferno Revealed-a guide inside the intriguing world of Dante. This book will reveal what Dan Brown gets right-and what he does not, all while exploring Dante's inspirations as well as the works he later inspired. This is an engaging introduction to Dante and his world. 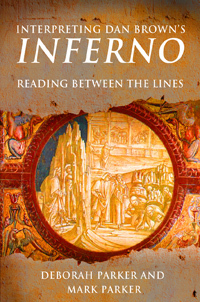 Inferno Revealed explores how Dante made himself the protagonist of The Divine Comedy, something no other epic poet has done, a move for which the ramifications have not yet been fully explored. The mysteries and puzzles that arise from Dante's choice to personalize the epic, along with his affinity for his local surroundings and how that affects his depiction of the places, Church, and politics in the poem are considered--along with what this reveals about Brown's and other past writers' usage of the work. 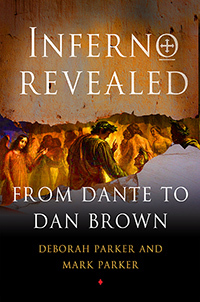 In this sneak peek into Inferno, Dan Brown's brand new novel, Interpreting Dan Brown's Inferno will provide readers with an engaging introduction to Dante and his world-and the ways in which Brown has repurposed Dante's famous work in his newest Robert Langdon novel. This teaser explores the Prologue and first chapter of Inferno and details to the reader what important facts-and mistakes-they should be aware of while beginning Brown's book. The connection between the Prologue's narrator, aptly named "the Shade," and Langdon is exposed, and the characters are even further illuminated by their relationship to Dante's poem. The reader will come away with an understanding of what Dante's poem can reveal about these characters and the mystifying city of Florence-and perhaps, where the rest of the book may lead.